As a truck driver I’ve heard a lot of bad language on my travels. In fact until about 2014 I used a lot of bad language, but I’ve chosen to eliminate it from my volcabulary. I feel nothing is gained by the added and unneccessary use of curse words, but it doesn’t mean I am not still exposed to them on a daily basis. Before I became a Christian in 2014, I was among the worst offenders in the use of inappropriate language. For some reason i had developed an attitude of “I don’t care” when it came to swearing, and it was difficult to restrain myself when I was in places where swearing was inappropriate and unacceptable. Once I began to drive a truck, it got worse and I developed what I refer to as a “trucker’s tongue!” Every second word out of my mouth was swearing. Going to jail only made it worse, as there is a certain way that everyone acts in jail, and I just followed along with it. But that all changed in just a couple of months as I got deeper into my Bible studies, and shortly I removed all swearing from my day to day volcabulary! I do know all the words, and unfortunately at times when things are not going well, I’ll slip, but that gets less and less all the time. But I don’t live in a glass bubble and so I am exposed to other people whose mouths are not under such control. But that is their issue and not mine. Some of my friends and associates, outside of the church, know my feelings and reservations and will respect me in such a way that they don’t swear in my presence, but not all. And many of the people I meet on my travels do not know the real me, and therefore they act normal and swear like sailors in my presence. I don’t flaunt my views in public, and so I never respond unfavourably to someone who chooses to swear around me. I wish people wouldn’t, but I also know that not everyone is in the same place on their journey as I am. And I also know its not my place to judge. The only people I have ever commented to about swearing are my kids and thats more as a father and nothing else! Swearing adds nothing to a conversation, and my mom used to just say it showed a lack of intelligence. I don’t think its the intelligence or lack of, that causes swearing, I just think its society in general. Things have degraded in society competely. 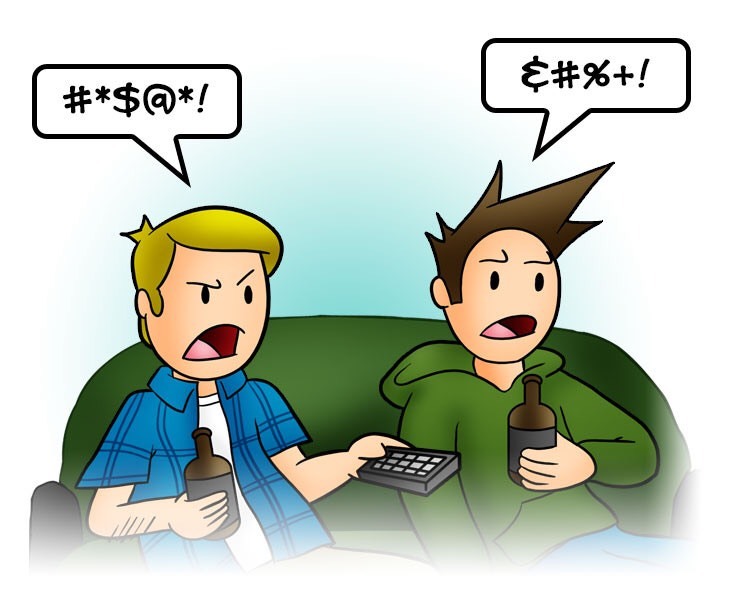 When I was growing up it was rare to hear cursing in tv or movies, but not its commonplace. And people mimic what they see and hear. There’s all sorts of “funny” videos of young kids dropping F-bombs on YouTube and they get hundreds upon thousands of views. But what is really going on? Think about it, kids only learn from those around them, so if they’re dropping the F-bomb, their caregivers must be doing it also. Once they go to school, they’ll use it around their friend and the circle gets wider! We have generations of kids growing up that feel its normal and acceptable to express themselves by using profanity, no matter where they are or who they are with. If you’ve seen any of my trucking videos that I’ve posted (Trucking Videos) you will notice that the sound is turned off and they’re all silent. Someone asked me if it was because during those videos I was swearing and didn’t want anyone to hear. I laughed and said no! The reason my videos have no sound is because I always have some background noise on the radio, be that music, news or the NASCAR channel, and I just think that those sounds detract from the videos, so I have the volume muted all the time. So with all that said, am I preaching? No! Am I perfect? NO!!!! Am I offended by your swearing? No! But I am just expressing my views and my side, which is what blogging is all about. Differing opinions are welcome and accepted. I recently got into a religious debate on Twitter, that very quickly became offensive when someone began to curse God! That is where I draw the line, but your bad language will not prevent me from having a discussion with you.